Normally, I'm not overly keen in doing multiple visits to the same restaurant, especially when I have sampled enough food to get a sense of the place. However, there are a few places that I really don't mind revisiting over and over again. One of them is EBO and the other is Mosaic. 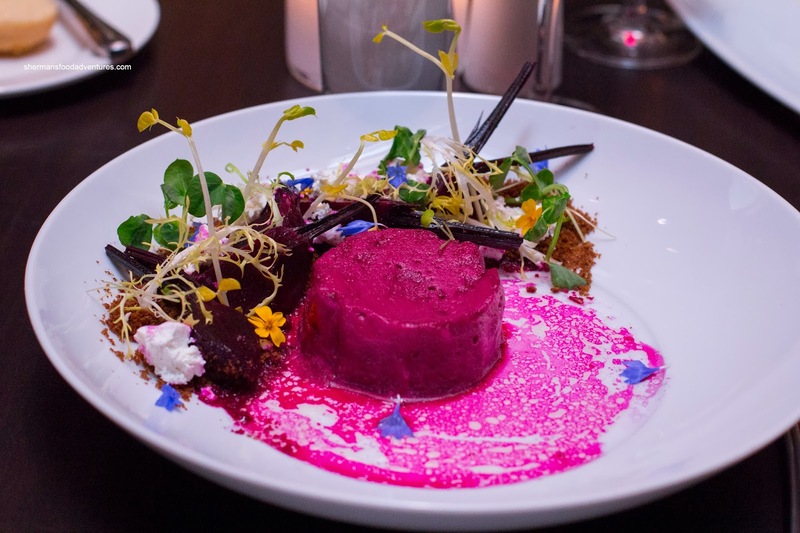 Ever since Chef Thomas Heinrich took over the reigns of the Hyatt Regency, boring hotel food has been taboo. Prior to that, eating at the Hyatt was as painful as watching motorists in Richmond navigate a traffic circle. 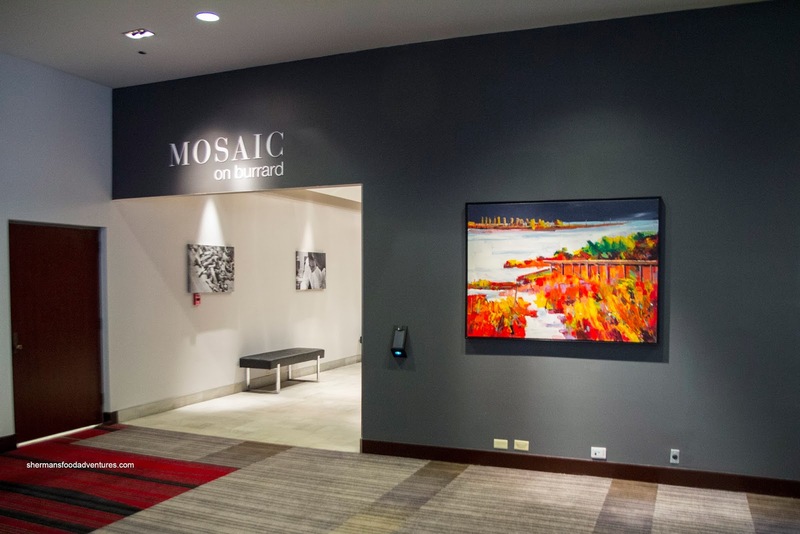 Recently, Grace and I dined at Mosaic to sample their new Fall menu. 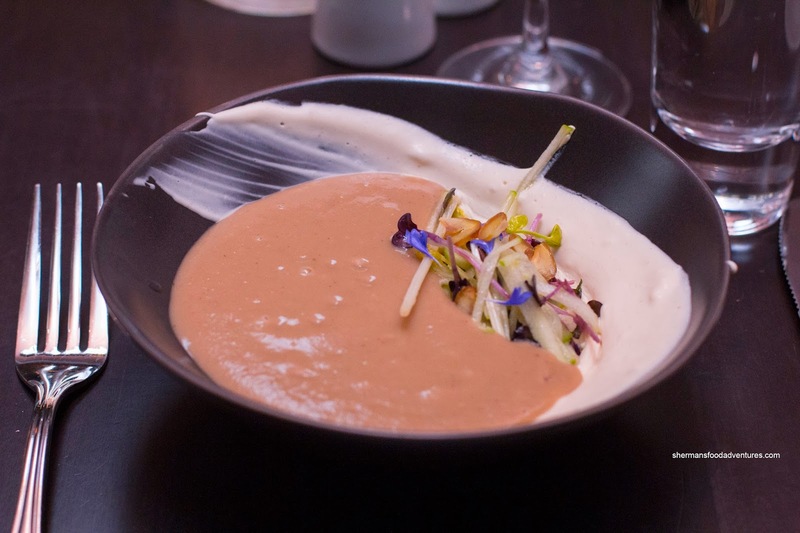 The meal began with the Roasted Chestnut Bisque with apple, mushrooms and spiced brandy cream. Personally, I'm not a huge fan of chestnuts, especially in Chinese cakes. However, this bisque wasn't that heavy, which "won" me over somewhat. The good amount of apple sticks was necessary in providing a touch of zip and crunch which cut through the heaviness. I wasn't able to get much of the brandy in the cream as the entire bisque was very mild. 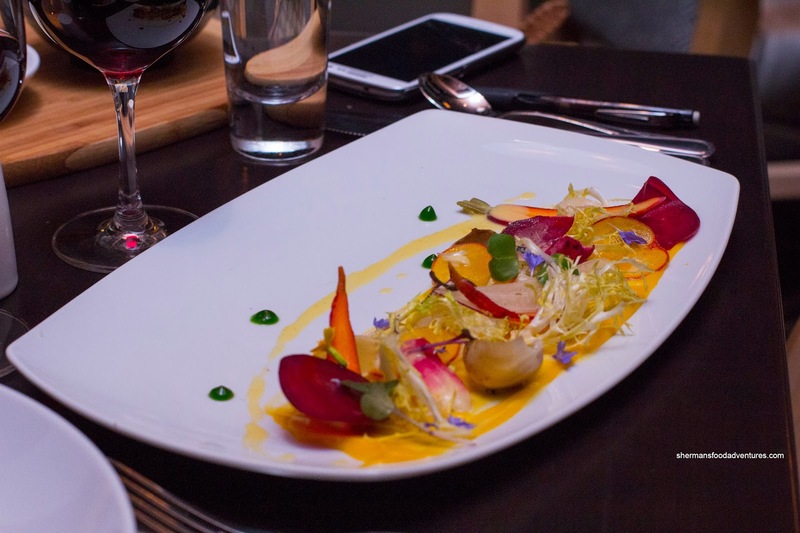 Next up was the Fall Salad with baby carrots, beets, frisee, endive, Tokyo turnips, fennel, squash puree, chive fluid gel and tangerine dressing. This was beautifully plated with appealing colours. Most of the components were crisp and crunchy. 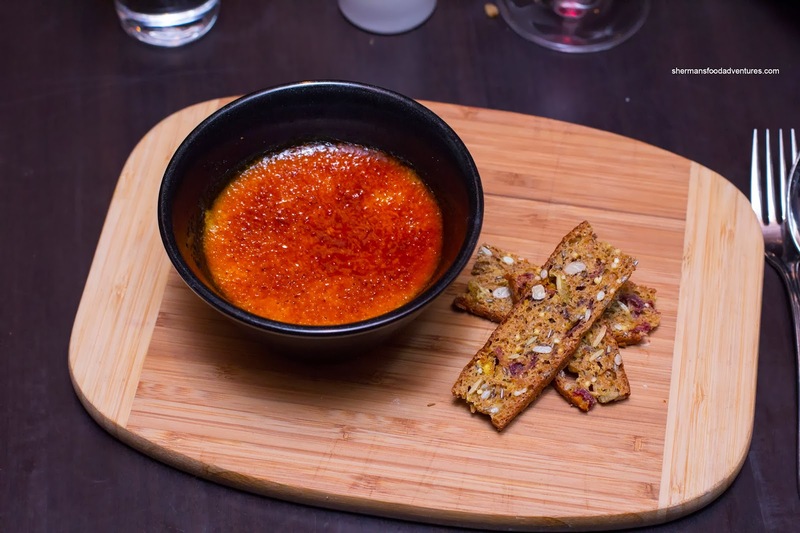 Dressed in a light and sweet tangerine vinaigrette, this was a refreshing and appetizing starter. Looking like a strange bloody puck, the Earth Apple Farms Roasted Beets was something out-of-the-box. The beet coloured puck was actually foam. It was ice cold, light and surprisingly refreshing. On the side, there was toasted pumpernickel soil, goat cheese, beets (with stalks) and sprouts with a beet vinaigrette. I found the beets to be firm while exhibiting an Earthy mild sweetness. 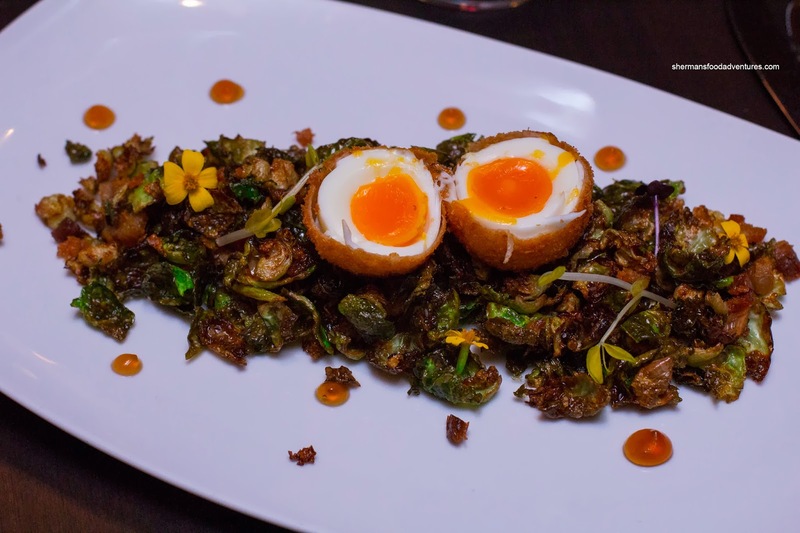 Onto some warm starters, we tried the Crispy Brussel Sprouts with Sloping Hill Farms heritage pork belly, quince jelly and 64 degree scotch egg. I really liked the fried brussel sprouts as they were aromatic and crunchy. The pork belly really helped in this regard. The quince jelly was super tart which was necessary to cut through the heaviness of the dish. I wasn't a huge fan of the egg as there was no layer of sausage (like a real scotch egg) to protect the white from becoming rubbery. The exterior was crispy though while the egg yolk was nicely runny. 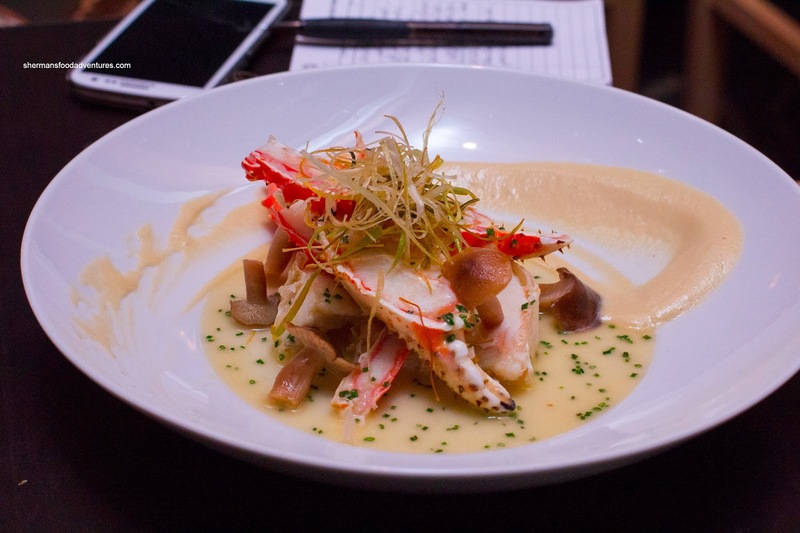 Our last appie was the Butter Poached Alaskan Crab with pickled mushrooms and leek puree. Strangely, the star of the plate was not the crab. Rather, it was the buttery and tart mushrooms which went well with the smooth puree. The crispy leeks provided a crunch as well. As for the crab, it was slightly dry, but benefited from the butter poaching. Moving onto the mains, we had 2 fish offerings first. Beautifully seared, the Long Line BC Ling Cod was crispy on the outside while flaky and moist inside. It was accompanied by butter poached lobster pomme puree, roasted baby beets and beet jus. Despite being super smooth, buttery and rich, the pomme puree was not showing a whole lot of lobster love. The reduced beet jus was more than a bystander as it livened up the flavours with tartness. 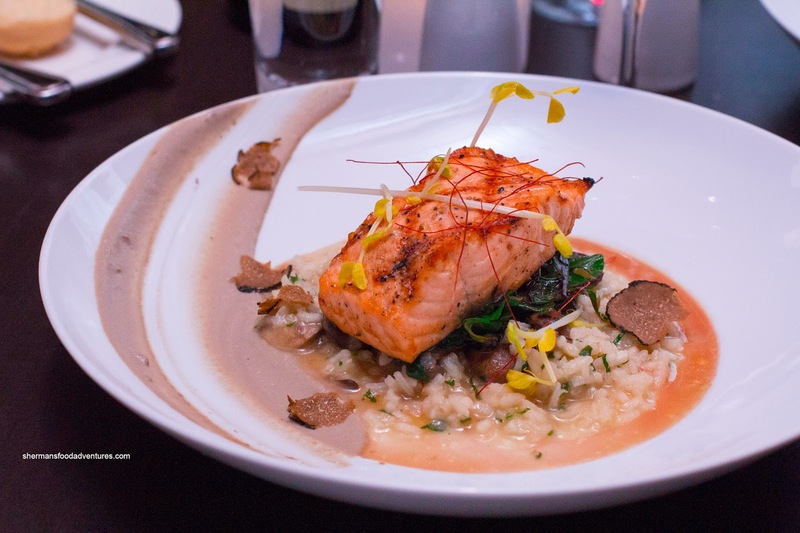 Equally moist and flaky, the Skuna Bay Craft Raised Salmon was served with Vialone Nano truffle risotto, Swiss chard and mushroom puree. Although the salmon and chard were executed flawlessly, the risotto was too soft and wet. 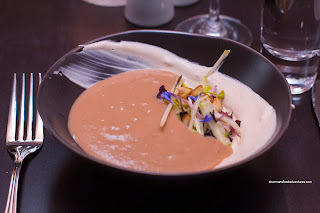 It was Earthy though while the mushroom puree added an extra-shot. Nearing the end of the meal, we were presented with a vegetarian dish - Grilled Curried Cauliflower Steak with baby carrots, dates and toasted pine nuts. Grace, having experience many home-cooked Indian meals, was not a huge fan of this. For me, the curry wasn't traditional and didn't show lots of developed flavours, but was not terrible either. Considering the venue, it was acceptable with a low rumble of spice. The cauliflower was firm while cooked all-the-way-through. 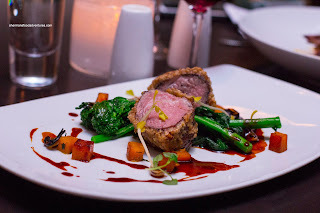 Our lone red meat dish consisted of the Sous Vide Country Lamb encrusted with spiced walnuts accompanied by broccoli rabe, butternut squash, pumpkin and charred onion lamb jus. Although the lamb was prepared beautifully moist and tender, the walnut crust was wet and mushy. That destroyed what would've been a fantastic dish. For dessert, I tried the Pumpkin Creme Brulee first. I thought the custard was executed beautifully where it was silky and rich. It wasn't too heavy on the pumpkin while it wasn't super sweet as well. The sugar topping just the right thickness where it was hard and torched evenly. Lastly, we had the Salted Chocolate Pear & White Chocolate Mousse with pears. This was a light and refreshing offering with only the slightest of sweetness. 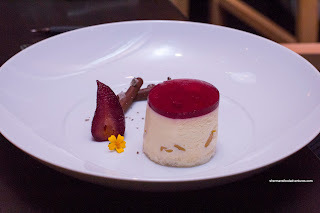 The port gelee on top added a nice bite. 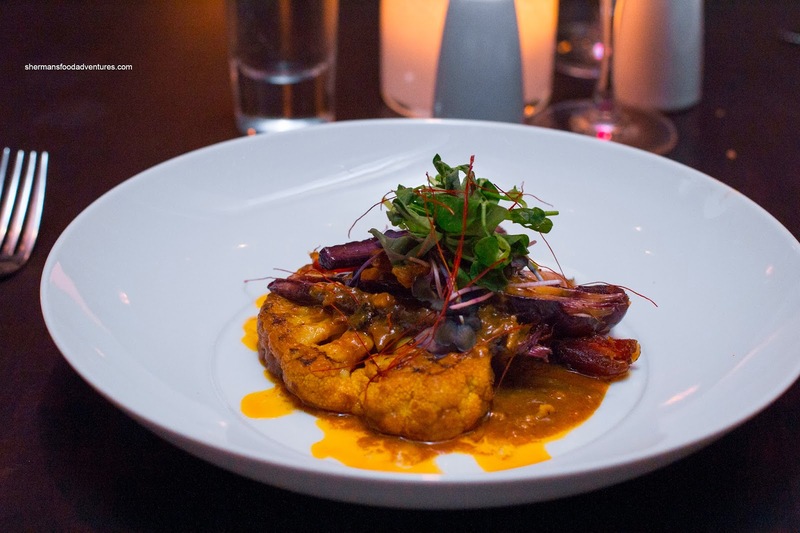 Overall, the menu fit the fall theme incorporating root veggies and a certain level of comfort. 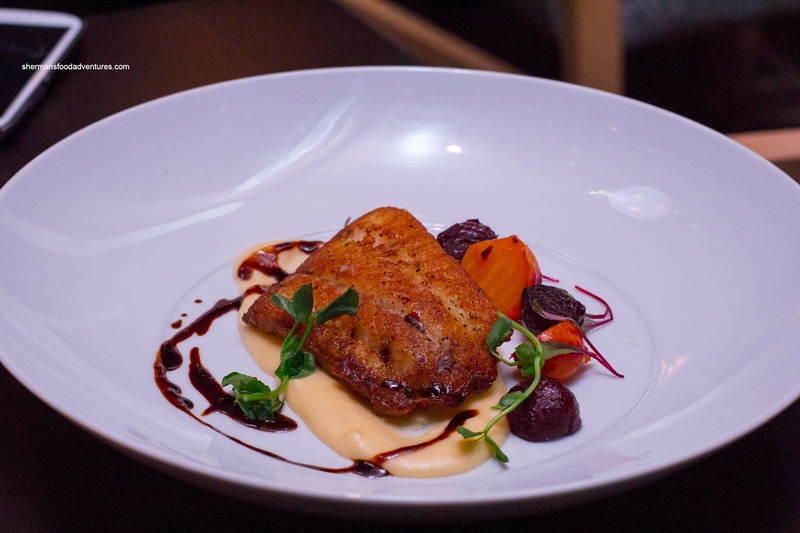 Not without a few flaws, the creations at Mosaic reflect the direction of Chef Thomas Heinrich.